Power Source: Honda GX390 commercial quality gasoline engine, Recoil start, Low oil alert shutdown. Pump: Triplex Hi-pressure commercial pump, Adjustable unloader valve, Thermal relief valve. Frame: Portable, Very Heavy Duty Frame, Two Pneumatic 13” Tires (tube type), Weight 150bs. 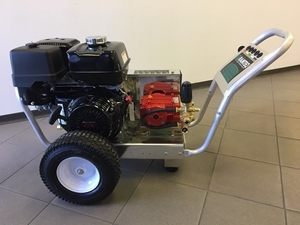 Standard Features: 50' Hose w/fittings, Trigger gun and lance with fitting, one set of spray nozzles, Low pressure soap injector w/soap nozzle. Concentrated butyl based all purpose cleaner and degreaser. Blue Clean is great for use as a medium-duty cleaning compound. Free rinsing. Quickly loosens dirt and softens bugs on surfaces. It contains soil suspension agents to keep dirt from re-depositing on surfaces and water conditioners to prevent lime deposits on glass and painted surfaces. Dark red in color. 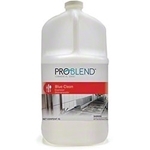 Concentrated detergent contains soil suspension agents to keep dirt from re-depositing on surfaces and water conditioners to prevent lime deposits on glass and painted surfaces. It produces thick stable foam that may be applied by hand or through a pressure washer. Bubble gum fragrance. 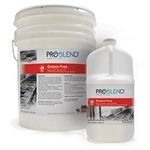 Designed to accelerate the bioremediation process, Grease Free controls the grease and odors found in drain lines and grease traps with its bacteria that digests grease and gives off CO2 and water as byproducts. Neutroleum fragrance. Alkaline and butyl solvent based degreaser penetrates and removes the toughest soils quickly and easily. HD Pride Cleaner contains alkalis, sequestrants and wetting agents for powerful heavy-duty degreasing.